This tutorial will teach you the basics to build digital models in MLCad. Furthermore it will show you tips and tricks and help with troubleshooting problems you might encounter. The tutorial is based on MLCad 3.3 and assumes that the program has been installed along with the LDraw parts library and is running smoothly. Make also sure the bars and panes have been rearranged to accommodate proper working. Don't be discouraged by its length, you'll be rewarded with a deep insight into the LDraw System Of Tools. You are going the build the micro scale dumper track above, getting to know the different features of the program along the way. Detailed building instructions can be found in the section Building Instructions, where you can also download the related LDraw file for comparison. NOTE! Before we start a last excursion on naming converntions: Since MLCad can be used on one side for part authoring and the other to set up large layouts with different models; beside mosaics or fractal landscaps; I use the name "project" to describe the things you can make with the program. (The screenshot shows all menus and dialogs in one composed image). 1. First of all we are going to tweak the interface a bit. Most of the commands and features of the program have been mirrored to the Toolbars for quick access. You'll mainly work with those, rather than the entries in the menu. The bars can be moved around, float above the interface or be docked to the borders. Move your cursor to the small vertical line at the left-hand border of the single bars, press and hold the left mouse-button and move the mouse to relocate the toolbar to a new position. Right-click the toolbars and check/uncheck the entries in the popping-up contextual menu to show or hide them. Arrange the bars as you like! The screenshot is a mere suggestion. Download the document below to get an overview of the single bars. You'll notice that some buttons are grayed out as well as their equivalents in the menus are  they'll become active only after some events have happened. MLCad does not allow you to save an empty project file and therefore neither the Save button in the Main bar, nor the Save command in the File menu are accessible if there hasn't been at least one part added to the current project. Models lists files which are stored in the sub-directory "Models" in the program's root directory (MPD-files are not shown). Favorites contains the favorite items of the user or basic parts needed in almost every project such as standard bricks and plates or Technic pins and axles if you're a Technic buff. We are going to add a Plate 1x1 to the favorites since we need three of them in different colors. Expand the sub-directory Plate, move the cursor above the first entry Plate 1x1 until it gets underlined and right-click. To add the plate to the favorites select Add to Favorites from the pop-up menu. Right-clicking on a favorite part (in the sub-directory containing the part as well as the Favorite sub-directory itself) allows you to remove it from the favorites by selecting Remove from Favorites. If you want to delete all parts in the Favorite sub-directory in one go just select Clear Favorites in the contextual menu. 3. Time to add the first part to the project. Grab the slider at the right-hand side of the Parts Tree pane or use the scroll wheel of your mouse. Browse through the sub-directory until you read Plate 2 x 2 with Wheels Holder. In case the window is too narrow, hiding some of the title, use the slider at the bottom to see the rest of the part's description. You might also hover over the text which will bring forward the title in a small text box. Left-clicking the part's name will show the part in the top left-hand corner of the Parts Preview pane below. The Parts Preview pane renders a visualized version of the Parts Tree. Press and hold the part either in the Parts Tree pane or the Parts Preview pane and drag it to MLCad's building and viewing area. 4. The area is divided into four sub-panes showing different views of the project you are working with. This is also a place where you can add and modify parts when you are in Edit Mode. In View Mode these panes are used to show the building steps of your project. While dragging the part over the panes you'll notice that the rectangle following the cursor changes shape: It is a bounding box, showing the part's size in relationship to the selected zoom scale. Drag the Plate 2 x 2 with Wheels Holder to the pane named 3D and release the mouse-button. Congratulation, you have just added your first part to the project! Parts dragged to 3D are placed at the origin of the project with all coordinates at zero. This is most important for the first part to avoid any offset, which is key when your going to fly around your project in 3D later in the building process. 5. Before we add more parts to the project we make some more adjustments to the program to ease building. Below the Title bar reporting the project's name - which is currently set to the default name Untitled since we haven't saved/named the project yet - you'll find the Menu bar. It cannot be moved or rearranged. The menus can also be activated via keystroke. Press and keep the ALT-key pressed and type the letter(s) which is(are) underscored in the menu. 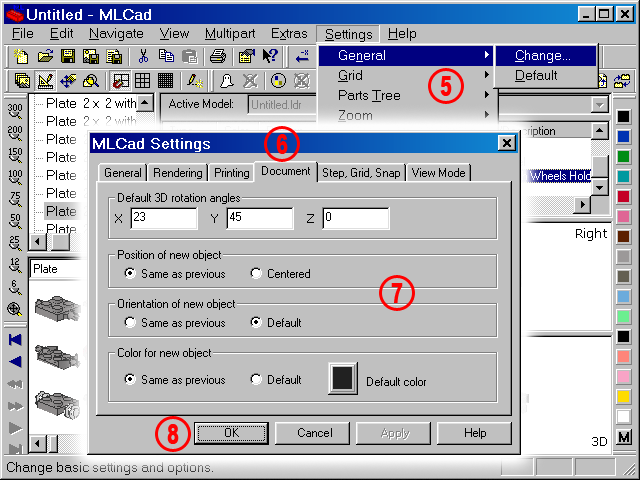 Use for example ALT+S+N+C to call the MLCad Settings dialog or select the Settings menu, the General tab, then Change... (Settings > General > Change...). 6. Click the Document tab. Default 3D rotation angles defines the viewing angles in any preview window offering a 3D view such as the Parts Preview pane or the previews in the Fractal and Rotation Model generators. You can enter the rotation angles for the three axes (each from 0 to 359 degrees). The view in the Parts Preview pane will be updated immediately once you've confirmed your choice by hitting OK. To see the 3D view updated you'll have to select View Angle > 3D from the contextual menu. Position of new object defines which position will be used if a part is added from a menu (example: Edit > Add > Part...) and not directly placed in the drawing areas via drag'n'drop. Same as previous means the part receives the same coordinates as the part prior in the parts list. Centered will center the part around the origin of the project. Orientation of new object sets the initial orientation of a part added to the project. If Default is selected the part will not be rotated. Same as previous will copy the orientation of the object prior in the parts list. This is best used when building in SNOT (Stud Not On Top) technique. Color for new object determines which color a part added to the project will get. If Same as previous is selected the new part will receive the color from the part prior in the parts list. Default assigns the color selected in the Default color box to all new part. The very first part added to a project will get its color from this setting, also if you have set the program to Same as previous. The Default mode is useful when building a project with a predominant color such as a gray castle or a red fire station. 8. Confirm your choice and exit the Settings dialog by clicking the OK button. 9. Just to make sure we are all on the same page check if Grid Coarse in the Mode bar is selected. If not click the button. The default value for Grid Coarse is 10 Step units on the X- and Z-axis and 8 Step units on the Y-axis. NOTE! 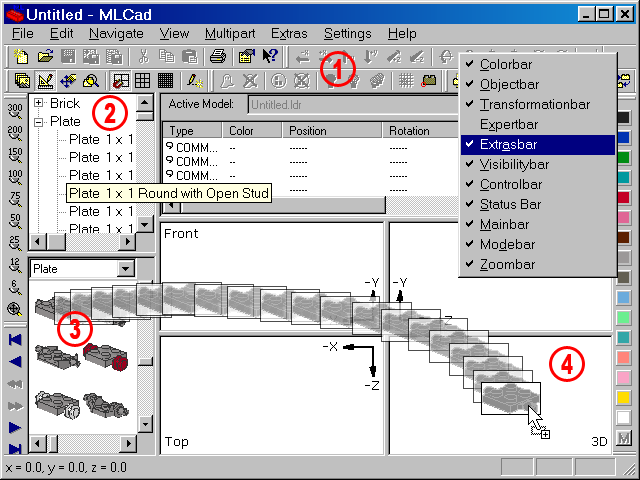 What MLCad calls Step units the rest of the LDraw Community calls LDUs  LDraw Units. LDU is a basic measurement unit equal to 0.4 mm. The spacing between the centres of two adjacent LEGO studs is defined as exactly 20 LDU. With the basic ratio of 2:5, for stud-spacing to plate-height, a Brick's height is 24 LDUs and a Plate height therefore 8 LDU. This means the parts will move 10 LDUs every time you use the arrow keys on your keyboard or the arrows in MLCad's Transformation bar. It will automatically snap to a 8 LDU grid every time you move a part up or down with the mouse. 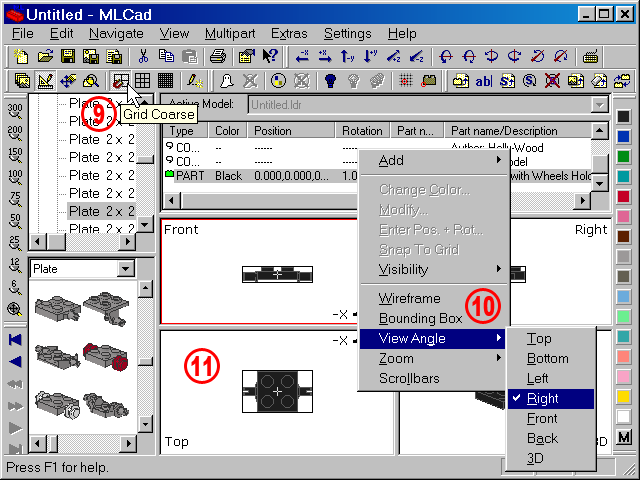 You might change the values on the Step, Grid, Snap tab in MLCad Settings dialog though 10 Step units equal a half brick-lenght distance and are ideal for fast building with standard bricks and plates with the studs ordinary at top. Keep also an eye on the short-cut available, listed at the right of the Settings > Grid menu. Pressing F9, F10 or F11 to switch between grids is much faster than selecting them via toolbars or menus. 10. Make also sure the views in clockwise order starting from the top left-hand corner are: Front, Right, 3D and Top. If you are looking at the project from different directions right-click the pane you want to change and select View Angle > (Your desired view) from the contextual menu. The pane you are going to change will be highlighted with a red border. 11. A highlight will also distinguish a selected part from an unselected one. This is key, since only selected parts can be manipulated. Regardless is you select a single part or multiple parts, they will be marked with the bounding box you've already seen above. If you are requested to select a part just left-click it in one of the building area panes and make sure it gets highlighted. To cancel a selection just click another part or click somewhere in the viewing panes not containing a part to clear all selections.